The 2018 ProCom Awards Night took place on Tuesday, November 13, honouring current students and alumni for academic and extra-curricular achievements throughout their studies. In addition to recognizing 20 students who maintained their renewable entrance scholarships, four undergraduate recipients were presented with specialized awards paying tribute to their innovation, entrepreneurship, compassion, and communication expertise. The annual Ontario Graduate Scholarship (OGS) and Ontario Graduate Fellowship (OGF) awards — conferred to master’s degree candidates Salman Qureshi and Laura Orlando, respectively — were bestowed based on the academic excellence displayed in their applications for admission. Two recent graduates of the Master of Professional Communication (MPC) program were acknowledged for their research and academic achievements. Katherine Yamamoto (MPC 2018) was presented with the Dean’s Award for Best Overall Performance in the MPC while Emma Morris (MPC 2018) received the Associate Dean SRC Award for Best Master’s Research Paper. Emma’s study, entitled “Communicating Self-Care in Feminist Non-Profit Organizations”, used qualitative content analysis to examine how women-focused not-for-profits frame employee self-care. The PCAA would like to congratulate MPC Class of 2014 alumnus Jacky Au Duong for his recent appointment as the Operations Coordinator at The Catalyst: a new Scholarly, Research and Creative (SRC) space for the Faculty of Communication & Design (FCAD) at Ryerson University! “Jacky began his journey in ProCom in 2013 as an MPC student. 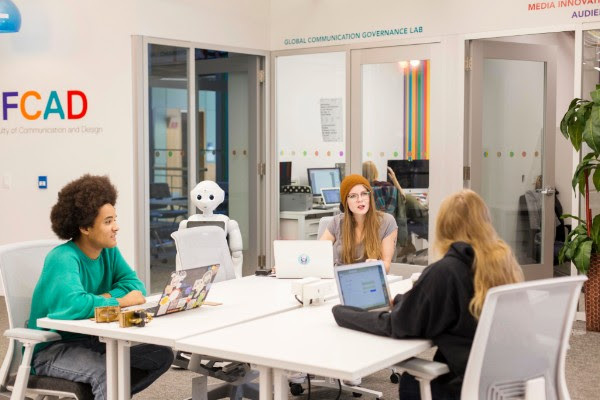 Since then, he has supported a number of key initiatives including: hitchBOT, the ProCom Alumni Association, and various knowledge mobilization projects through the CCK. Most notably, Jacky’s position in the CCK and his commitment to increasing the visibility of ProCom students and alumni has helped make ProCom students central to knowledge mobilization projects in both FCAD, Ryerson and the greater community. Jacky will continue to be a part of ProCom in his role as a lecturer for the new CMN279 Hybrid course and as an alumni member. Our Winter 2018 Issue is all about mental health.